2017 marks the 50th anniversary of the JPhys series. To mark this on Journal of Physics A: Mathematical and Theoretical, we’re celebrating our historical work with our Viewpoints collection and up-and-coming researchers with our Emerging talents special issue. We also want to be able to celebrate our authors and are awarding certificates to the authors who have published the most papers in the journal over the last 50 years. The first of these certificates has now been awarded to Tony Guttmann. 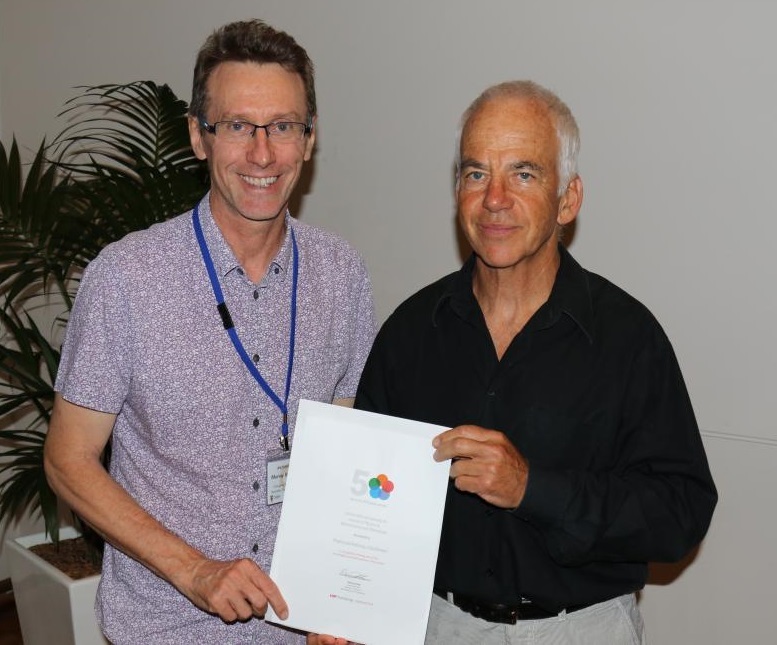 The certificate was awarded at the Fifth Annual Meeting of the Australian and New Zealand Association of Mathematical Physics, by former Editor-in-Chief of the journal, Murray Batchelor. You can read more about Tony’s contributions to science in this special issue of the journal, which marks his 70th birthday. We look forward to celebrating more of our loyal authors throughout the year. Image owned by Jonathan Kress, used with permission.